Jake Tapper of ABC News has uncovered an email that seems to question Washington's support for the the security of the diplomatic efforts in Libya. Jake Tapper of ABC News has uncovered an email that seems to question Washington's support for the the security of its diplomatic efforts in Libya. 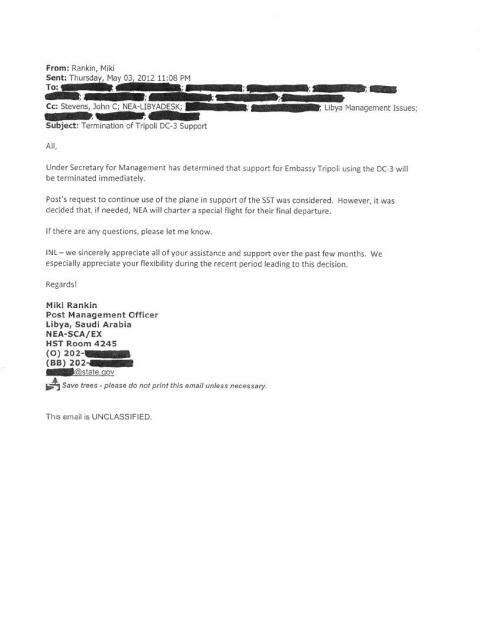 The email, dated May 3, refers to a request made by the Libyan embassy in Tripoli to secure a private plane for use by the "Security Support Team," a unit of Special Forces troops handing security for State Department officials. The plane was used to ferry personnel and equipment around the country, but after commercial airline service was restored across Libya in the spring, officials in Washington decided it was no longer necessary and turned down the request. As Tapper says, no one really believes the plane itself would have made much difference by September 11, when the consulate in Benghazi was attacked and burned down. (The SST that requested the plane was not even in Libya in September and one State Department official affirmed that it would not have been needed once commercial air service was restored.) However, the email might be interpreted as evidence that backs up the growing criticism facing the Obama administration: That they were unconcerned about Libya's security situation and ignored those concerns when they were raised by officials on the ground. The decision to reject the plane request was apparently made by Undersecretary of State for Management Patrick Kennedy. So while the email is not exactly a "smoking gun" of government failure, it will surely lead to more questions and more digging, as every communication between Washington and Libya over the last year will face increased scrutiny.